Royal Caribbean International has been working on its next class of cruise ships since shortly after its landmark ship Oasis of the Seas entered service in December 2009. One thing that has been remarkable about this effort, known as Project Sunshine, is how little has leaked out about these ships. While there has been much speculation and rumor, all that was known for sure was that there would be two ships approximately the same size as RCI's Freedom of the Seas and that they were to be built by the Meyer Werft shipyard in Germany. 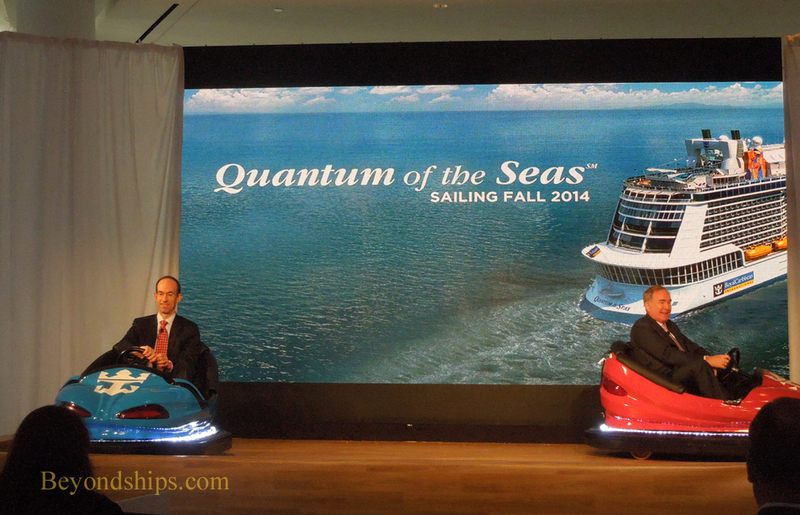 Earlier this year, Royal announced the names of the ships, Quantum of the Seas and Anthem of the Seas. 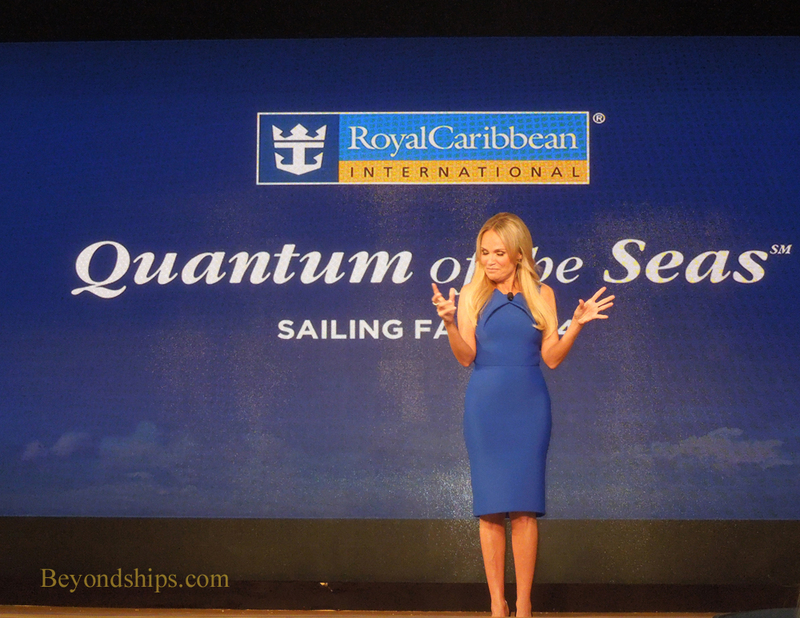 On April 16, 2013, Royal held an event in New York City to reveal plans for Quantum of the Seas. All too often when a cruise line announces a new class of ships, the new class is actually just an improved version of the line's existing ships. Not so with Quantum of the Seas. It is not an improved Radiance of the Seas, a slightly larger Freedom of the Seas, or a condensed version of Oasis of the Seas. “It is a different approach. We just felt it was time for some new things that we have never done before and we think it is coming out beautifully,” noted Royal Caribbean Chairman Richard Fain. 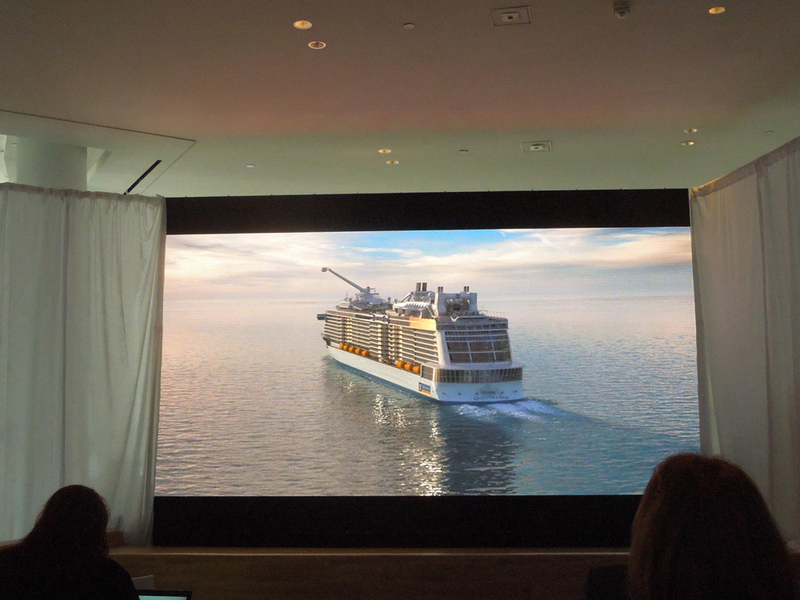 Indeed, the new ship will dispense with some trademark Royal Caribbean features. “There is no Royal Promenade and there is no ice skating rink. It is a different design. This really is a new class of ship. It is all its own,” said Lisa Lutoff-Perlo, Executive Vice President of Operations. This is a bold move. Every large Royal Caribbean ship since Voyager of the Seas premiered in 1999 has had these features. Guests adore them. But Royal is unwilling to let the triumphs of the past become an anchor that prevents the line from moving forward with new concepts. 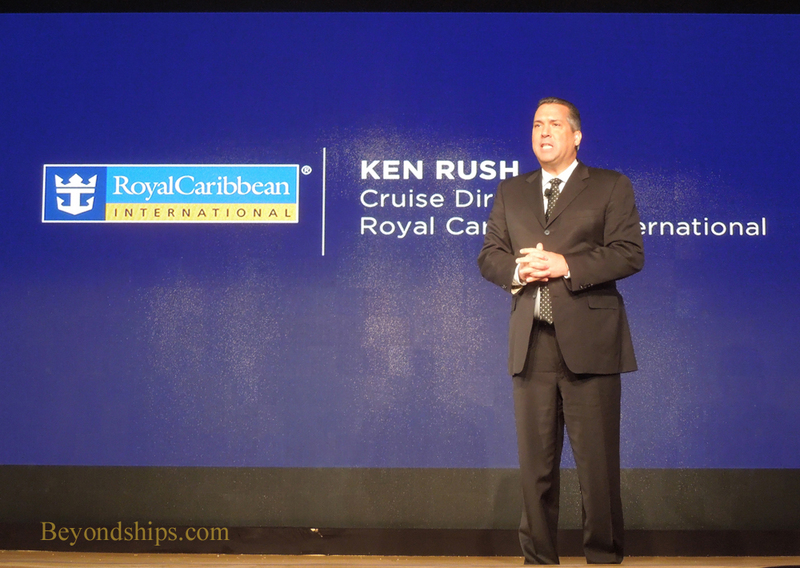 RCI cruise director Ken Rush acted as MC for the unveiling event (above). He first introduced Quantum's godmother actress Kristen Chenowith (below). Guests then viewed a video with computer animations that created a virtual ship both inside and out. Following the video, Richard Fain, Chairman of Royal Caribbean Cruises Ltd., and Adam Goldstein, President and CEO of Royal Caribbean International arrived on stage in bumper cars. One of the venues on Quantum will be a bumper car arena. RCCL Chairman Richard Fain (above) and RCI President and CEO Adam Goldstein (below) then made presentations about Quantum of the Seas and answered questions from the audience. Quantum's nautical qualities is discussed next.